I have another confession: I am now singing a very different tune. I’ll get to the reason for this in a minute, but first let’s compare two ExecuteSQL statements, which were discussed last month in FM 12 ExecuteSQL, part 1. Both calcs ask the same question, but the second one employs dynamic parameters, and as I mentioned at the time, you can embed as many “?” characters as you wish within your ExecuteSQL statement, as long as you provide a corresponding number of “arguments” to tie them to. The official word from FMI is that dynamic parameters can be used “in order to avoid security vulnerabilities through injection attacks”, but there’s another, more utilitarian, reason to use them: They make your life easier. #1 seems to me to be self-evident, and if you’re thinking, “Yeah, but you’ll end up segmenting your SQL statement into chunks anyway to avoid breakage when fields are renamed…” a) you’re absolutely right, and b) that will be the topic of an upcoming article, so I’m going to skip over that concern for the time being, except to say that if you incorporate dynamic parameters into your code, the amount of segmentation will be less than it otherwise would be. But what do I mean in #2 about arguments behaving in a FileMaker-like manner and avoiding SQL headaches? Namely this: FileMaker’s internal SQL parser is exceedingly picky about certain things that FileMaker is more relaxed about, and by using dynamic parameters, you can enjoy the warm and cuddly treatment you’ve come to expect from your favorite database program. Of course there’s no law that says you have to use dynamic parameters in your ExecuteSQL statements, but we’re going to compare non-dynamic (a.k.a. “Standard”) and dynamic queries containing 1) text, 2) numbers and 3) dates, and I bet you’ll be convinced by the time we’re through. …which is included in today’s demo file, ExecuteSQL Dynamic Parameters, if you’d like to follow along. …but if you try to pull a similar stunt with dynamic parameters, FileMaker will do its usual fine job of protecting you from yourself. When you reference a number in the main body of an ExecuteSQL statement, you must NOT, repeat NOT, wrap it in single quotes, but with dynamic parameters you can treat the number exactly as you would in regular FileMaker, which is to say, you can wrap it in double quotes or not, as you see fit. By the way, here’s something it took me a while to figure out: with the standard approach, what determines whether a string of data is interpreted as a number or as text is the underlying field type, not the data itself. Allow me to rephrase that, because it’s important: it doesn’t matter whether the data looks like a number, what matters is the type of field the data resides in. But you only have to worry about this if you’re using the standard approach… when you use dynamic parameters, the string (not the underlying field type) is what matters. Once again, we don’t have to worry about this if we use dynamic parameters. I’ve saved the best for last. We are so spoiled in the FileMaker world when it comes to things like dates… when you pop into find mode and type ">4/2" (without the quotes) into a date field, what does FileMaker do? First off, it determines (via the regional date format associated with the current file) whether you mean the 2nd of April or the 4th of February, and then it tacks on the current year for good measure. 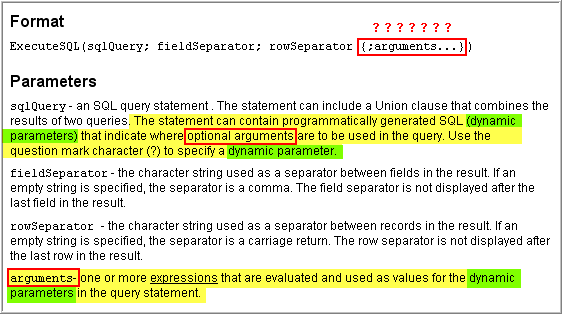 Here’s how a similar query can be implemented via ExecuteSQL. We would like to determine the sum of all sales occurring later than the highlighted date, and unfortunately what would strike most FM developers as the “obvious” approach doesn’t work using standard syntax, but works as expected if we go the dynamic route. The standard approach is going to require a custom function or some Let wizardry, and you can see an example of the former in the demo file. Well, that’s about enough for today. In an upcoming article, we’ll look at some techniques for making ExecuteSQL statements more robust. This entry was posted in ExecuteSQL, Level: Intermediate, SQL, Version: FM 12 or later and tagged Dynamic Parameters, ExecuteSQL, FQL, SQL on May 2, 2012 by Kevin Frank. OK. I didn’t really get how much this took off your plate in terms of quoting and formatting. Good stuff. The date handling itself makes dynamic parameters an excellent choice. I had to develop a solution that essentially acted as a front end for a MySQL backend, and ended up having to do all sorts of work-arounds when handling the dates. If I had FM12 back then, I would have shaved at least a day off of my development and troubleshooting time. Thanks for the write-up! Excellent explanation, Kevin – thanks! Thanks for the kind words, folks. I truly appreciate them. Thanks Eden. I just downloaded the latest version. Incidentally, apart from the obvious practical value of SQL Builder, I really like the design aesthetic. Very informative, i really hadn’t grasped the benefits yet myself. Have I missed something in the documentation ? I don’t claim to know the answer, but here’s why I *think* it’s failing. You can only use parameters to specify “criteria” (e.g., “San Francisco”), but not “sources” (e.g., the City field in the Location table). Beware of reserved words when using ExecuteSQL. I had been in the habit of using the field name “date” in a table when there was only one date field and didn’t need a descriptor or modifier (i.e. not a fromDate, toDate, etc.). Since “date” is a reserved word in SQL, my queries returned a “?”. Changing the date slightly (e.g. dateReceived ) makes all the difference. Great post! Really explained the argument for Arguments well. Saved me a ton of researching. Definitely agree with the other commenters here: excellent post Kevin! I would wholeheartedly embrace parameterized queries but one aspect of them is holding me back: you can’t name the parameters! Not a huge deal if there’s only one parameter, but once you have more than 1, you have to mentally keep track of which question mark goes with which parameter. That, to me, is a glaring flaw and results in statements with poor readability. Like all good complaints, I turned this into a positive and submitted a feature request for named parameters. Hopefully mine is not the first of its kind. You know what else I should do? Submit a request to rename the “arguments” argument to “parameters”. I think that would make more sense, especially to those who have experience in other SQL environments. Very, very, very helpful! Good job Kevin! You’re very welcome John. I appreciate you saying so.